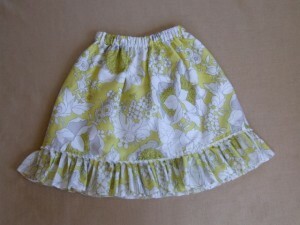 I had a frenzy of skirt-making the first week of last summer. During this week, my eldest usually goes to his grandparents, leaving me with time to have my last fit of crafting before shifting to summer mode and saying goodbye to such indoor domestic pursuits for the season. Sigh. 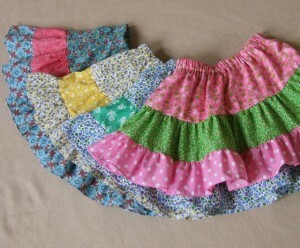 Skirts are satisfying in that they are easy, pleasing, and can come in handy. 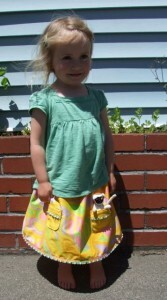 I decided to make these tiered skirts so I could have fun combining some fun vintage prints. This one I made for my then three-year-old. I loved this fabric my mom found for me second-hand, but it was sheer, more appropriate for a curtain, so I lined it and added a bottom ruffle to the lining. We rarely have weather warm enough for such things, but one can always hope. I also made this one for her because the only fault of a little girl’s skirt, in my estimation, is that it may lack the all-important pocket, or pockets, necessary for transporting those little girl essentials, whatever they may be: pebbles, sticks, a used band-aid. Or, in this case, a tiny lemur friend. 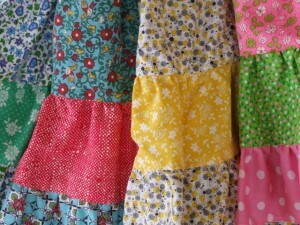 So there is my unseasonal ode to summery skirts. I love them all, especially the model. My favorites: yellow sheer, two yellows, & blue & turquoise.